In consecutive references to narrative characters, narrators usually alternate between the use of proper nouns and pronouns. This study aims to provide a comprehensive and cognitively plausible account of reference maintenance in online narrative discourse production. The corpus research reported in this study offers an analysis of the grammatical and discourse factors affecting referential choice in narrative discourse production. The analysis is based on a large corpus of written narratives, elicited through visual stimuli (a comic). 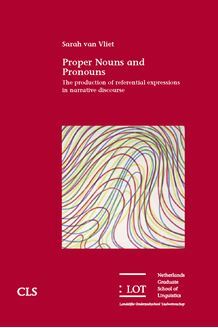 The results of the quantitative analyses indicate that in the maintenance of reference to narrative characters, the choice between proper nouns and pronouns is guided by two mechanisms: an independent distance-based alternation of proper nouns and pronouns, and the repetition of proper nouns after discourse­structural boundaries. These linear and hierarchical factors can be assumed to exert their influence through the fluctuation of (assumed) referent salience. The relation between context factors and referential form stems from the salience characteristics inherent in the nominal categories proper noun and pronoun, which accounts for reference maintenance at both the clause and the discourse level. Proper Nouns and Pronouns should be of interest to researchers working in the fields of text linguistics, cognitive linguistics and psycholinguistics.